It’s not a spoiler to say the title of the film and though “Us” could very well speak to nothing more than the characters of said film speaking about themselves, well, that overly-conspicuous Jeremiah 11: 11 cardboard sign turns up for a reason, signaling the movie’s double meanings even while giving the less theologically minded something to Google on their phones in the theater lobby afterwards. “Us’s” opening image is of a television set, its dated commercials indicating the time is 1986. But when the ad ends, the screen momentarily goes black, leaving a reflection of Adelaide (Madison Curry). 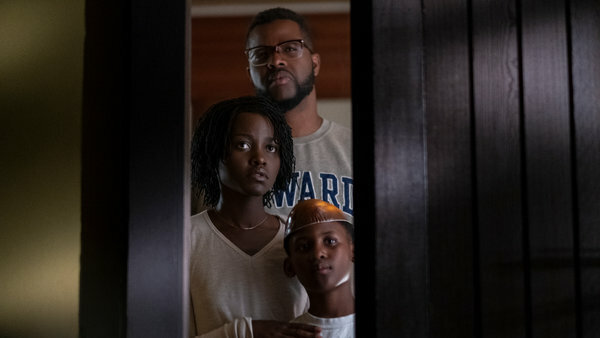 It’s the first time we see her, the mirrored reveal foreshadowing how the impending horror of writer/director Jordan Peele’s film comes in twos. Still, a filmmaker does not open with a vintage Hands Across America TV advertisement and then echo it with hand-holding imagery throughout if he is not cultivating a deeper point. And unlike Hands Across America ultimately being remembered more in the abstract, “Us”, despite overstuffing on symbolic flourishes, is an objective success. The inciting incident of “Us” takes place at a nighttime carnival on a Santa Cruz pier where Adelaide drifts away from her squabbling parents, off the boardwalk and down to the beach. There, as lightning engulfs the sky, an eerily lit funhouse beckons with its neon slogan “find yourself”, a hoary mantra the ensuing sequence literalizes in a fiendishly clever way. Indeed, when Adelaide wanders inside, subsequently becoming lost in a hall of mirrors, what she finds is not a reflection but a literal double, though the scene cuts away before we fully grasp the true meaning of what we’re seeing, the ensuing film gradually filling in that deliberate ellipsis. That triggers a cut to the present-day and an SUV bearing adult Adelaide (Lupita Nyong’o), her husband Gabe (Winston Duke) and their two kids – Zora (Shahadi Wright Joseph) and Jason (Evan Alex) – in the backseat, bound for their summer home near that same Santa Cruz beach. Even if this returning-to-the-scene-of-the-scary-experience locale was not explicitly cited, Nyong’o’s closed-off, clammed-up performance evinces the Something in the Air vibe anyway. Not that Peele hurries to unleash mayhem, planting infinite set-ups as the family goes about getting settled, all of which might come across more telegraphed if these scenes were not simultaneously such a convincing, true-to-life evocation of an equally loving and exasperated family unit. If they are tight, their family friends, Kitty (Elisabeth Moss) and Josh (Tim Heidecker) Tyler and their twin daughters, are more of a Real Housewives of Santa Cruz situation, with Josh casting garrulous judgments about Gabe’s possessions and Kitty, in a deliciously wicked comic performance by Moss, sipping rosé to emotionally ghost on her own life. If you might wonder why they are friends, Peele is more concerned with juxtaposing their respective economic realities, the Tylers insulated and oblivious and reliant on an Alexa soundalike eventually employed to the terrifyingly yet hilarious hilt while Adelaide and Gabe are defined more by the latter’s motorboat, an emblem of pointless striving that wonderfully comes home to roost in both literal and figurative terms. Not that Peele forgoes thrills for theme. “Us”, even more than his preceding “Get Out”, is pure horror, morphing from a home invasion movie to a blood-splattered chase, equally suspenseful, unsettling and with just the right doses of tension-releasing humor, yielding jumps, gasps and laughs in equal measure, each seed Peele plants sprouting to full effect, none more than a pesky outboard motor. It is a regular horror movie, in other words, and though Peele inundates these scenes with social commentary, he also cleverly seeks to use the normal horror movie watching experience, in which we are compelled to root for the protagonist, against us, waiting to spring his final narrative trap. It’s an incredible emotional rewiring that forces you not so much to rethink every preceding story detail but how each one made you feel, as if uncovering a betrayal of your instincts, a sensation that coursed through my body in the climactic moment involving Adelaide and her double where Nyong’o’s incredible guttural exertions occupies the unhappy medium between exorcism and possession. If this sudden mental backtracking, however, initially seems at paradoxical odds with the implied meaning of the worldwide stakes peripherally raised throughout, the emergent unsettling brilliance is how the movie has been running on a parallel track all along, not just flipping your perspective but tying your sympathy up in knots. As the chasm between America’s haves and have nots keeps widening, Peele ingeniously brings that divide to life through his deepening twists, a tale of simple survival curdling into a fight to stay on top.